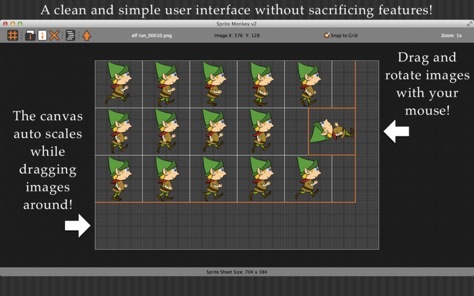 Sprite Monkey is the smallest and fastest sprite editor without sacrificing features! Quickly edit your sprite sheet/strip, aka “texture atlas”, in a simple uncluttered user interface. Easily create sprite coordinate scripts in the “no plugin” script editor for any game engine or programming language. Export custom PNG images not found in other editors for a smaller file size. Check out the feature list below! Quick Sprite Strip – When images are initially loaded, they are laid out in a sprite sheet format. You can quickly change them to a sprite strip by using the “command + T” keys. Clip Alpha Image – Clip 32bit images by using the “-” and “+” (Shift + on a compact keyboard) keys so you can overlap the images. This evenly clips the width (or height if rotated) of all the images, so it doesn’t interfere with the animation sequence. You can use the “command + R” keys to collapse the images to their new clip size. 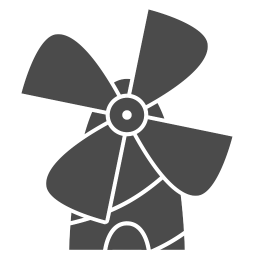 Script Editor – The “no plugin” script editor allows you to easily create and export sprite coordinate scripts for any game engine or programming language such as Xcode, HTML5, Cocos2d, PureBasic, etc. Save your work to a Sprite Monkey Project file. All your images and current progress are saved into a compressed “*.smpf” file.